The information about your salon and spa are extremely important to your clients. More accuracy where your clients are looking for you will increase the likelihood of your chairs and tables being reserved before the day begins. Rannko PowerListings helps you maintain accuracy on over 100+ listings via data integration, giving you more time to keep on cutting and massaging while your listings do the work for you. Update & Sync hours, address info, payment methods, photos, social and more with the click of a button to 100+ listings directories. Analyze the listings that help your salon or spa as well as suggested information recommendations from your guests. 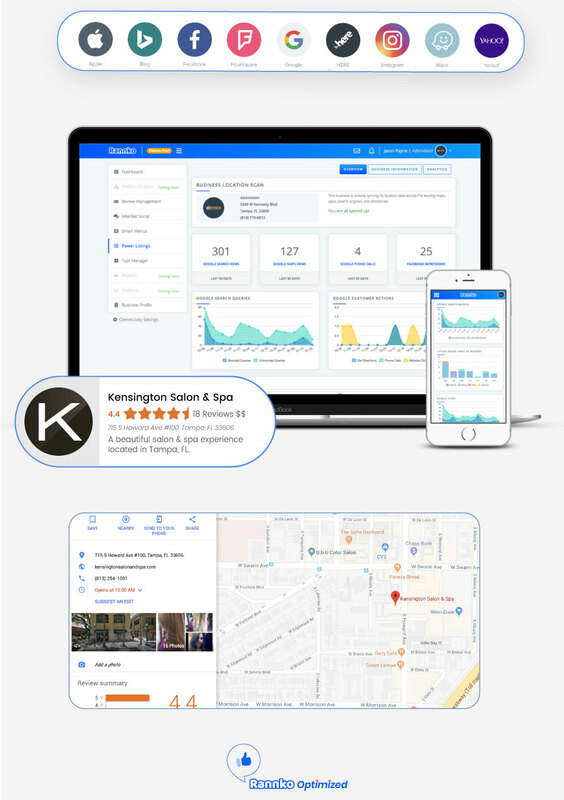 Monitor your listing activity, phone calls, directions, map views to social and Facebook impression. Comprehensive analytics at a glance. Give consumers the knowledge they seek, including the name, address, and phone number of each of your locations. Pinpoint your coordinates so consumers know where to find you. Leverage your service items to help you rank for more unbranded searches. Drive consumers to the most up-to-date version of your online services. The more efficient your salon or spa is, the better experience your clients will get from you and your staff. Making the best of your time can be hard without a thought-out plan, a course of action. Rannko's Task Manager gives you the ability to organize what needs done to keep you running smoothly without extra stress. 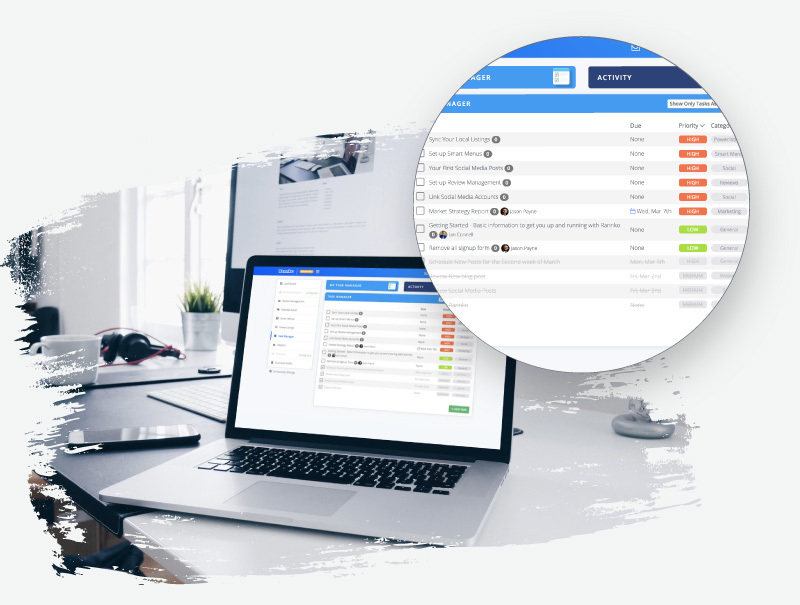 Planning tasks and managing your team never has been easier. Create, monitor, and edit tasks for you and your staff. Insert as little or as much detail as needed to ensure your office is at its peak and your patients are taken care of. Checkup on you and your team's progress through the Task Manager Activity tab. Make sure you're keeping everything in check and balanced for the overall health of your salon or spa. The website of your salon or spa is your chance to shine and greet your guests with a smile and provide them an excellent pre-visit experience. Ensure they book appointments with your business by optimizing every aspect of your website. Web Analysis by Rannko thoroughly examines your website and provides you suggested recommendations to apply to your site and help boost the overall user experience, leaving no stone unturned. Eliminate the competition with a compelling, user-friendly site! Stay up-to-date with new Products on the way! Your digital health is helpful to providing your clients top notch experiences online before giving them stellar service in person. 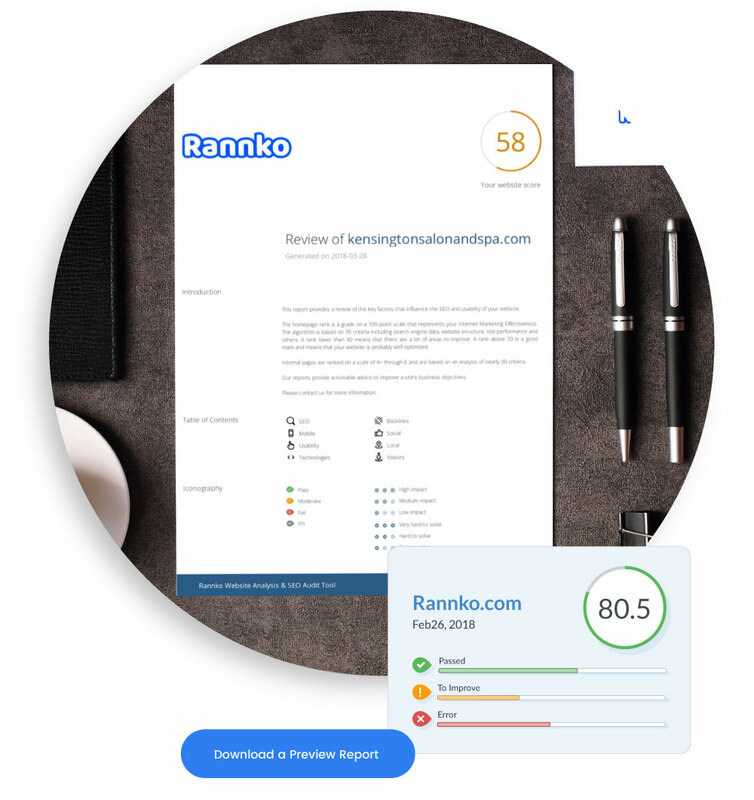 With Rannko's Analytics insights, you'll be able to look at the well-being of your website, seeing where your clients spend the most time how they use your website. This information will help you keep you tailor your services and your efforts to giving them what they want and what they need. Take a deep breath and know where you stand. Rannko is here to partner with your salon or spa, giving you the power to focus more on your clients when they come to visit you. We want to give time back to you and also give you the means to a strong digital footprint. To see how Rannko would help you and your salon or spa, schedule a 30 minute demonstration with our team. Your success matters, and our team is here to get you there. Get involved with Rannko and take ownership of your digital health today!